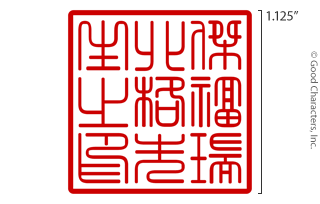 Nine-Character Stamp™ only at Good Characters: Nine is a mystical number in China. It symbolizes eternity. It’s said that a dragon has nine sons. There are nine types of dragons. The Forbidden City, the imperial palace of the Ming and Qing dynasties in Beijing, is said to have 9,999 rooms (although the actual number depends on how one defines a room). 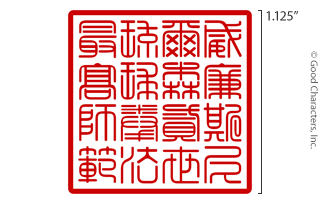 Thus, a nine-character stamp is one of our most popular. 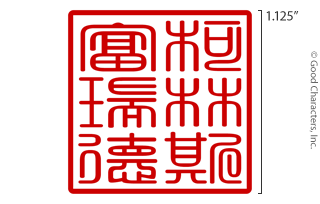 No matter how long or short your name is, our Chinese naming experts can create a nine-character representation of your name (and title, if you wish) and rank and style for your master signature seal. Some masters prefer a six- or four-character stamp. 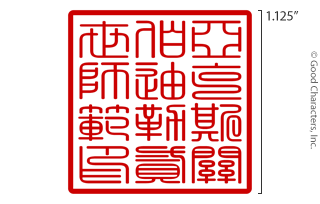 There are two ways to lay out a six-character stamp. Our experts will choose the best design according to your individual name. 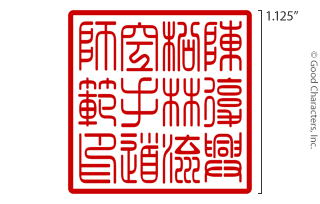 Characters are typically arranged vertically from top to bottom, from right to left, in accordance with ancient tradition. In this example, John is represented by the two right-most characters, Johnson by the two characters in the middle, and Shihan by the two characters on the left. 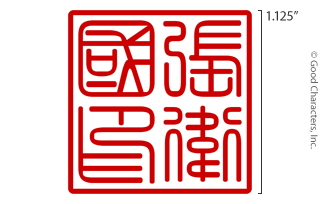 In English, the title is placed before the name; in Chinese, Japanese, and Korean, the title is placed after the name. 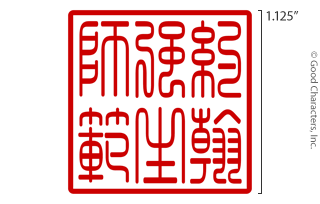 Here’s another example of a six-character stamp. We have Collins (three characters on the right-hand side) and Fred (three characters on the left-hand side). Sometimes the four-character design makes a great impression with high visual impact, especially when the name is short or has very few syllables. Again, our experts will design a stamp that’s most appropriate for your unique name. The twelve-character design is also popular among instructors who have a lot of information to include in a stamp. You may mention your favorite layout or design on the order form and we will custom design it for you. If you want to go to the max, you can have a 16- or even 25-character stamp. We don’t charge by the number of characters, so you can include as much info as you desire. However, a word of caution: An all-you-can-eat offer doesn’t mean the more the better. If you are wondering how much to include in your stamp, feel free to add that comment on the order form in the “special instructions” box and we will evaluate your request and design the best stamp for you. Typically a Master stamp has your name and, if you wish, your rank or title. Your martial arts style can be included as well. For example: Master John Smith, Goju Ryu; Sifu Allen Yuan; Sensei Lisa Lynn; or Sa Bum Nim George Rodriguez. So in the following box, type the name to be translated into Chinese, Korean, or Japanese and, if you wish, title, style, and/or rank. If you already know the characters you want, you can also enter them here, or you can email the text or image to us at info@goodcharacters.com.